In 1903, the Westminster Church sanctuary was renovated by Tiffany Studios who stenciled Christian symbols in gold leaf throughout, including the chancel arch and eleven in the chancel. The designer was René Théophile de Quélin. René Théophile de Quélin, born in Brittany, France, came to the United States in 1881. He assisted Saint-Gaudens on the decorative project for the Vanderbilt mansion, and subsequently worked with John La Farge. Saint-Gaudens put him in charge of showing the young Frederick MacMonnies how to work in a sculptor's studio. René deQuelin is listed as one of the associated artists at St. Gaudens National Park in Cornish N.H. His art is spread across this country, France Canada and Japan. 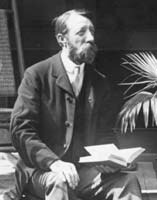 René de Quelin worked for both Augustus St. Gaudens and Louis C. Tiffany. He also did sculptures and many water colors. De Quélin designed stained glass, and for ten years was the head artist for Tiffany Studios, New York. A stained glass window he designed for Tiffany won an Imperial Gold Medal from the Emperor of Japan in 1911.